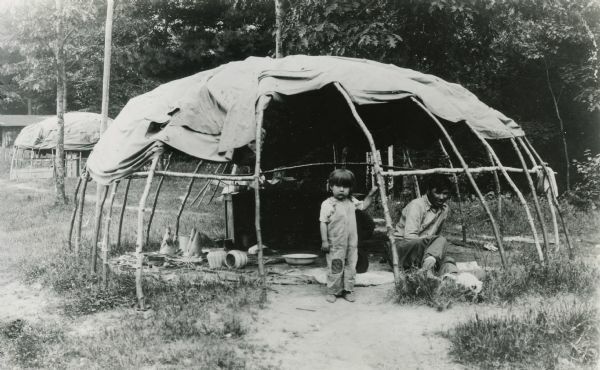 Winnebago Indians called themselves "Hochungra," meaning "People of the Big Voice." A Siouan people, they once occupied the southern half of Wisconsin and the northern counties of Illinois. Loss of territory to Anishinabe tribes starting in the 1500s was a large factor in the Ho-Chunk separating into groups, leading to economic dependence on European goods and a decline in population. In the late 1700s white miners, encouraged by the federal government after the Louisiana Purchase of 1803, began encroaching on Ho-Chunk territory to extract valuable lead for ammunition from the Fever River Valley. The Ho-Chunk were prominent supporters of Tecumseh’s pan-Indian rebellion and the War of 1812. Miners continued to invade Ho-Chunk land, even after leaders signed peace treaties with the federal government. Large areas of land were ceded in agreements with the federal government, followed by a long period of removal starting in the 1820s.The Black Hawk War of 1832 and a series of treaties forced the Winnebago out of their homeland, and they were removed to reservations in Iowa, Minnesota, South Dakota, and finally to a portion of the Omaha Reservation in Nebraska.With each removal (totalling eleven), small bands of Winnebago returned to Wisconsin, with the largest settle­ment in Jackson County. 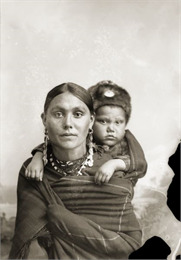 Portrait of Ho-Chunk Woman and Child, 1887 ca. Some Ho-Chunk decided to resist and stay on their homelands – the Wisconsin Ho-Chunk are descended from these people. Other groups who were removed suffered greatly in the process. A tribe in Nebraska exists today because survivors of a harsh removal to South Dakota were able to flee to an Omaha reservation in 1865 after a quarter of the tribe died on the journey in the winter of 1863. The government attempted to remove the Wisconsin Ho-Chunk repeatedly, but many returned to Wisconsin, finally receiving special legislation to remain on 40 acre homesteads. With a small foothold in Wisconsin, the Ho-Chunk hunted, gathered, fished, worked on cranberry marshes, and participated in the tourism industry to survive. Mission schools were created starting in 1878, and in 1893 a government school in Tomah was opened to offer education and forced assimilation (children were not allowed to speak their own language or express traditional culture). By the time of the Indian Reorganization Act in 1934, the Ho-Chunk were fighting to petition the government to redress past wrongs in the U.S. Court of Claims. They eventually won compensation in 1974 for lands lost through fraudulent treaties. The Ho-Chunk made gains in their land base little by little, and created a constitution with the help of the National Congress of American Indians in 1963. Despite the many challenges they have faced, the Ho-Chunk have reclaimed over two thousand acres in twelve Wisconsin counties. The Ho-Chunk Nation’s economic gains from the gaming industry have provided support for tribal programs including health clinics, Head Start centers and family services. Other activities include heritage preservation, wellness programs and reintroducing a small bison herd to Wisconsin. Source: Loew, Patty. Indian Nations of Wisconsin (Madison: Wisconsin Historical Society Press, 2001).